Udupi, Nov 02, 2017: It was a brilliant Lakshadeepotsava festival at Udupi devasthana on Nov 1, Wednesday. Devotees poured into the devasthana in Car Street to mark the festivities. 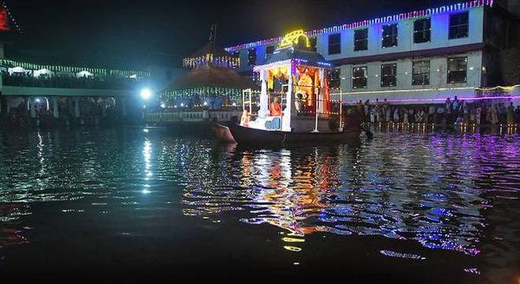 After offering prayers at the Sri Krishna Mutt/Temple, the idols (utsav murthis or idols taken out during procession) of Lord Krishna and Lord Mukhyaprana were brought on a palanquin and placed in a decorated boat at around 7.30 p.m. It went around the ‘mantapa’ at Madhwa Sarovar. This is known as Teppotsava. Then, the utsava murtis were kept in the Garuda Ratha, while those of Lord Ananteshwara and Lord Chandramouleshwara were placed in the Mahapuja Ratha and taken around the Car Street. Vishwesha Tirtha Swami of Paryaya Pejawar Mutt in a wheelchair, Vishwaprasanna Tirtha, junior seer of Pejawar Mutt, Vidyasagara Tirtha Swami of Krishnapur Mutt, Vishwapriya Tirtha Swami of Admar Mutt, and Vidyavallabha Tirtha Swami of Kaniyur Mutt, participated in the festival. Thousands of oil lamps lit up Car Street in specially constructed wooden rows. Earlier in the day, Tulsi Puja was performed at the Sri Krishna Mutt/Temple. In the afternoon, Vishwesha Tirtha, Vishwaprasanna Tirtha and Vidyavallabha Tirtha, joined the devotees in placing earthen lamps on wooden rows on Car Street. Later, the ritual of Kshirabdi, was performed at the mantapa of the Madhwa Sarovara. Laksha Deepotsava is celebrated during Uthana Dwadashi.